This is a non­existent fence. This is the most amazing fence in Russia. The thing is that this fence doesn’t exist, but it keeps sending people to jail. This fence surrounds the summer cottage of Governor Alexander Tkachev, a frequent hero of my blog, the same one whose daughter became a billionaire at the age of 22. So, Tkachev illegally installed this fence around his summer cottage at the coast of the Black Sea. When environmentalists filed a complaint to the prosecutor’s office, they got a reply informing them that there is no fence. 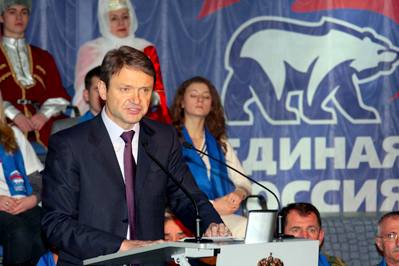 But if there is no fence, than it is impossible to write governor Tkachev’s fair description on it (Sanya – thief), isn’t it? However, it turns out, that the governor’s non­existent fence is even better guarded than any existing one. A criminal investigation into the “property damage” has begun. This case, laughed at so much in the beginning, eventually caused ecologist Suren Ghazaryan’s political emigration, while ecologist Eugeny Vitishko was sentenced to three years probation. So, on the day of Khodorkovsky’s liberation, Krasnodar authorities decided to change Vitishko’s probation into a real jail sentence on the pretext that Vitishko was one day late to register with the penal inspection. I myself being on a similar probation must register with this penal inspection twice a month. It’s just a formality – sign and leave. Nevertheless, Vitishko is now in danger of getting three years in jail and his wife will have to care for their two minor children alone (and the judge specifically noted that her 25 thousand ruble [$765] salary is enough for that purpose). The whole case is very clearly described here. Be sure to read. This information about Vitishko must be spread as widely as possible. Of course every political case is reprehensible, but here they have gone far beyond any bounds of reason. These ghouls build cottages for themselves with unknown means, surround them with illegal fences, and anyone spray­painting the word “thief” on it gets sent to jail for three years. You can learn more about actions to support Eugeny Vitishko in the blogs of Oleg Kozyrev, Suren Gazaryan and Evgenia Chirikova. Privet Alyosha. Do not think that people in USA and around the world do not know of your efforts to expose the criminal government of V. V. Putin. You and like-minded Russians represent the real future of Russia. Russians who want a Russia free of corruption, where real opportunities are available to all--instead of a few privileged friends of the current dictator--and a truly modern economy. We keep you and your fellow dissidents in our hearts and minds. Always.